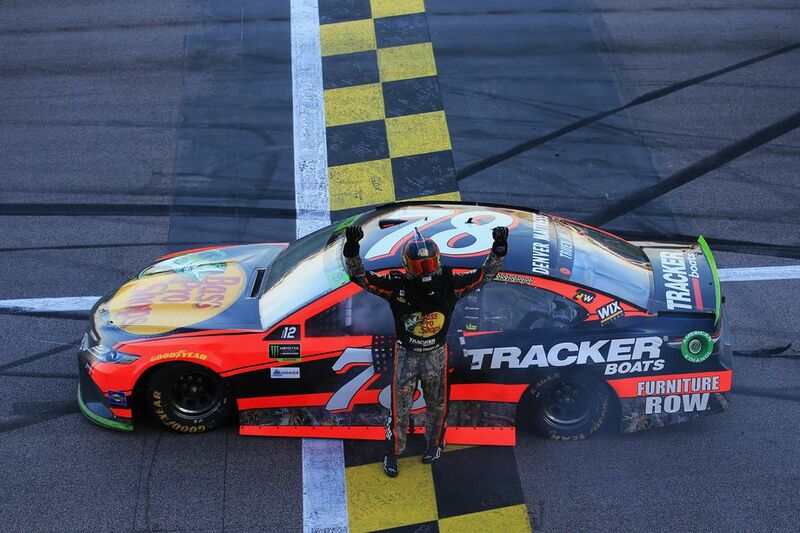 Martin Truex Jr. finished out the second round of the Monster Energy Cup Series playoffs the same way he started it, with a win. Truex worked himself from the back twice in the first two 80-lap stages, also falling to the back because of an unscheduled pit stop for a loose wheel on Lap 91. Kurt Busch finished second followed by a number of playoff contenders led by Ryan Blaney, who was sent to the back,after failing pre race inspection. He quickly worked his way through the field and finished third. Chase Elliott was fourth and Denny Hamlin fifth, Kevin Harvick finished eighth, while Kyle Busch finished 10th and Jimmie Johnson 11th all of these drivers made the cutoff line for the round of 8. Brad Keselowski was 13th after his win last week at Talladega sent him to the next round.One of the heavy favourites for making the final 4 at Homestead,was Kyle Larson,he entered this race 29 points above the cutoff,however very early on in the first stage,disaster stuck.Larson’s motor exploded on the front stretch of lap 77,and all he could do was hold out for a miracle that some bad luck would befall a couple of the other playoff drivers,unfortunately for Larson it didn’t work out in the end. More than a dozen cars were involved in a crash on a Lap 198 restart that began with and Erik Jones spin. Among those involved included playoff drivers Ryan Blaney,Matt Kenseth and Jamie McMurray. Kenseth was parked for the rest of the race, because too many members worked on the car when it was under the crash-repair clock,that error proved to be extremely costly,as it ultimately knocked him out of the Chase. Larson, Kenseth,McMurray and Ricky Stenhouse Jr were the four eliminated. The first race in the round of 8 starts next Sunday at Martinsville,which is normally a very unpredictable little short track,so it should be a interesting one to kickoff the next round of the playoffs.